Power of Common Core to Reshape Vocabulary Instruction Reaches Back to 1944! [S]ome reading experts, including those who helped write the Common Core State Standards [emphasis added], are saying what’s critical about vocabulary instruction is how the words are introduced—and that context is key. “We’ve known for a long, long time from research that giving students a list of words and asking them to look them up in the dictionary and write a sentence is not an effective way to teach vocabulary,” said Nell K. Duke, a professor of literacy, language, and culture at the University of Michigan in Ann Arbor. A better approach, some say, is to have students focus on a topic—anything from the musculatory system to the Great Depression to Greek myths. “It turns out that learning about the world is a great way to build your vocabulary and knowledge,” said David Liben, a senior content specialist for the literacy team at the New York City-based Student Achievement Partners, a nonprofit professional-development group founded by the lead writers of the common-core standards [emphasis added]. But this amazing revolution in vocabulary instruction created by the Common Core is not the much more dramatic story. The following suggestions seem to be implied by the findings and observations stated. 1. We can extend vocabulary by providing a wealth of rich experiences: trips, hand work, discussion, reading. The teacher can make sure that words are related to things seen…. 3. We can take time to expand meanings…. 4. We can teach students to learn meanings from context [emphasis added]. This is the natural way. Children learn to talk through hearing words in context, deriving meaning from the situation (other words used, speaker’s tone, objects present, actions which accompany the words)…. 5. We can help students judge meanings of words by those previously known…. Or Do We Witness Yet More Hokum? Well, yes, the pose taken in the EdWeek piece above is yet more hokum. As I have noted, the miracle of “close reading” offered by the marvel that is Common Core is just repackaged New Criticism, and now, the miracle of Common Core and vocabulary instruction is little more than even more evidence that enormous amounts of money, manipulative politicians seeking their own aggrandizement, and an uncritical media are a powerful and dangerous combination (and I made that calculation without the benefit of Common Core math). If anyone actually cares about effective literacy instruction, and not pandering to fruitless but incessant obsessions with accountability, standards, and high-stakes testing, the published works of Lou LaBrant spanning the 1920s into the 1960s offer a wealth of the many ways we have known to foster literacy in students, well before the Common Core architects and advocates were born. My ongoing coverage of low quality education journalism is not supported in any way by the Bill & Melinda Gates Foundation. 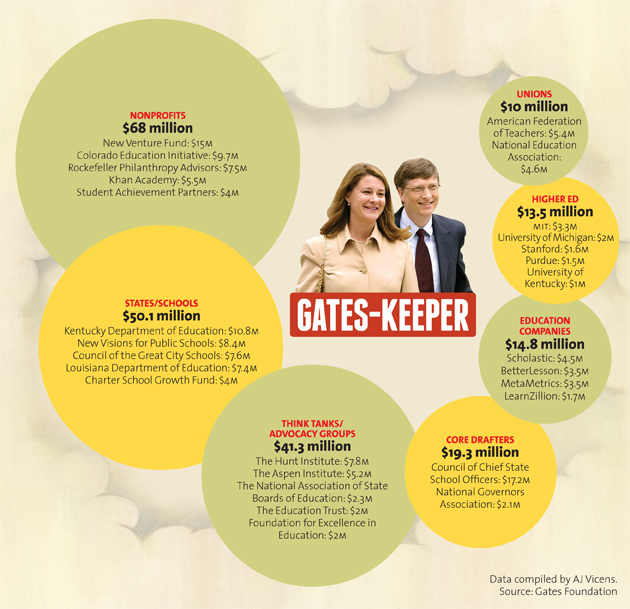 * Bill Gates Spent More Than $200 Million to Promote Common Core. Here’s Where it Went. See In Defense of Poetry: “Oh My Heart” for the likely impact of Common Core on teaching poetry. Just reading books, lots of books, was how it worked for me. I was a horrible student. I hardly did any of the work assigned in high school and to this day I don’t know how I graduated from HS even with the 0.95 GPA that I had. What I was doing when I should have been paying attention in class, doing the class work and homework? I was reading an average of two books a day, and I was a student helper in the library one period a day for four years of high school. The only A’s I earned in HS were from my elective credit working in the library. Most of my grades were D’s so even though I don’t remember, I must have done just enough work to be left alone so I could read. It was easy. I sat in the back row in every class and hid my SF, Fantasy or historical fiction novels by using the class textbook as a cover, nd I don’t remember even one teacher bothering me. Of course, now, having been a public school teacher for thirty years (1975-2005), I know that the children who get most of the attention from the teachers are either the straight A students or the children who most at risk children who disrupt the classroom on almost a daily basis. A quiet student sitting in the back of the room with his eyes buried in a book was probably the least of the teachers worries and challenges. Wizard of Earthsea by Ursula K. Le Guin (6.9) I read all if not most of her books.